my lowercase life: 50 YEARS IN THE MAKING!! It's been awhile since I've read the book, so I'm not able to nit pick every moment, like I normally do when books are turned into movies. The books are always better, but I have to say they are doing a pretty great job with The Hunger Games! And the crowd did not disappoint! There were friends made, line skippers taken out, and grown men brought to tears. The Police were called to escorted a purple haired women out of the building for smoking and drinking in the theater. When she was first confronted by management she was dropping the F & C words left and right and once the police showed up she left with anger in her face and tears in her eyes. It was an all around great night!! I highly suggest you go see it tonight, because Saturday is a worldwide holiday. Tomorrow is the day we have all been waiting for for the past 50 years!! You: But Luna, you are only 25...? You haven't even been alive for 50 years, so how can you have been waiting for tomorrow for that long? THE DAY OF THE DOCTOR!! The 50th anniversary of Doctor Who! I am so excited!! I am totally geeking out! If you're not a Whovian you might think me a mad woman with a blog. I am definitely a mad women with a blog! I'm getting my fish fingers and custard ready for the party. I have my favorite t-shirt washed and ready to go. I am even making cookies! 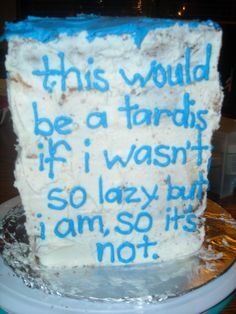 I'm thinking about making a cake as well, but in all honesty the cookies are pushing my skills and effort. Cake or no cake it will still be a brilliant! to show you just why I love this crazy 50 year old show.